Originally posted in July 2009, this was a very personal reflection on some very important people in my career. I suspect that most professional photographers keep a pool of pictures that they use for promotional, exhibition and portfolio purposes. I have always had a folder full of my favourites and now that I am freelance one of my regular tasks is to update it. The death of Mr Henry Allingham who was, at the age of 113, the oldest surviving veteran of the First World War made me go through and think about some of the people that I have had the honour of meeting and photographing. My folio folder had no fewer than five images of people who have died since being photographed by me. As a percentage, that’s not out of the ordinary and three of them were very elderly indeed. Each of the five people had a big effect on me for various reasons and I’d like to share some memories of them with you. Dame Iris Murdoch was a brilliant novelist whose life story was made into a film “Iris” starring Dame Judy Dench. I photographed Iris Murdoch and her husband John Bayley in the garden of the home that they shared in Oxford where he was a professor of English. She was, by the time that this picture was taken in 1998, suffering from the latter stages of Alzheimers’ – which is a terrible disease that robs the intellect and then the personality of the sufferer and places a great strain on those who love and care for them. Dr Bayley described her as being like “a very nice 3-year-old”. 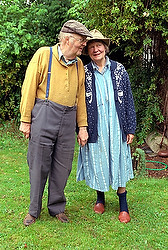 This picture was on the back cover of the book that he wrote about their life together. The house had not been properly cleaned for a long time and there was a television in every room playing the same programme. When I went to see the movie made of her life two women in the row behind me made comments about the house that they lived in and that she could not believe it could have been as bad as the film made out. The temptation to turn around and tell them that the film did not tell even half of the story was strong, but I resisted. She died in Oxford on February 8, 1999. 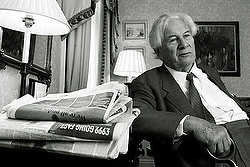 Sir Peter Ustinov was an actor, writer, director and raconteur. This picture was taken in his London hotel shortly before he died in 2004 aged 82. I’m not going to attempt to precis his life, but I’d like to tell my story about my time with him. I was searching for something to chat to him about and I used one of my “fallback” topics of what I had heard on the radio on my way to meet him. Every morning BBC radio 4 has a news show called “The Today Programme” which that morning had a feature about the USA and communism. I mentioned Senator McCarthy and Sir Peter then delivered a wonderful and vitriolic soliloquy on the topic of McCarthyism – job done. I’m pretty sure that you would have had to pay a lot of money for a forty minute private performance from Sir Peter. I feel so privileged to have had it for free. 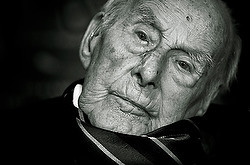 When I met and photographed Mr Henry Allingham he was already 112 years old. Despite his amazing age he was very coherent, had a very British sense of humour and was interested in everyone and everything around him. I found meeting him very humbling and, when he died, I found myself counting the ways in which our world has changed during his lifetime. Cars, planes, computers, atomic bombs, heart-transplants have all become commonplace. Queen Victoria was still on the throne of Great Britain when he was born and women did not get the vote until he was in his late twenties. 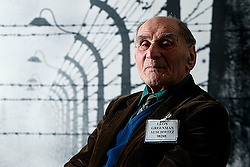 Leon Greenman OBE was the gentlest of men. Meeting him and being given a personal tour of the Holocaust Museum in London where there is a display featuring a large number of his personal possessions from before and during his time in the concentration camps had a profound and lasting effect on me. His striped uniform with it’s Star of David, photographs of his wife and children who died in the camps, pictures of his life before the Nazis came and took the Jews away were there and he was there to talk about them in a factual but moving way. I will never forget the day I met him and I hope that the amazing work he did to educate subsequent generations about the evils he witnessed goes on. The death of people who have lived long and valuable lives is sad. The death of a child is far sadder. I met Fleur at a children’s hospice near Luton a few weeks before her untimely death. She was a sweet child who wanted to know all about everything. Keech Cottage Children’s Hospice in Bedfordshire provides respite and terminal care for children with life limiting conditions. It is not a sad place. The children there are pretty much like any other children. The families that I met had come to terms with the fact that they would lose the child that they loved and were making the most of their time together. I was welcomed, I was royally entertained and I would go back tomorrow if they’d have me.